These spurs are made of brass. They have curved "swan" or "goose" necks and small steel rowels which still turn. There are buttons or studs on the end of each arm. There is a shaped brass buckle with steel tang attached to one side of each spur. Originally there would have been leather straps and two brass chains, only one chain survives. The inside of the heel band is stamped "J.W. 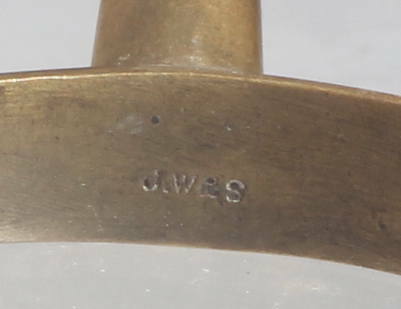 & S." - probably J.Wise & Sons of Walsall a company which produced military ornaments and fittings around 1905. The spurs are very similar to the regulation M1888 spur worn officers in the US cavalry, but the buckles have slightly sharper corners .